DAVID ZYNGIER. Spending more on private schools doesn’t guarantee success! It is often claimed as fact that private schools outperform public schools. New analysis of MySchool data and 2017 Victorian Certificate of Education year 12 results shows that public schools with similar Index of Community Socio-Educational Advantage (ICSEA) rankings or Socio-Economic Status have very similar or even better VCE results than private schools. However, these public schools achieve these results with far less funding per student. Those who argue in favour of public funding for private schools claim that private schools are more efficient and academically outperform public schools. So what is the actual return on investment for parents when it comes to private schools? The conservative side of politics believes there is no equity problem to address in Australian education. The Liberal Party relies on conservative researchers’ evidence denying any causal link between socioeconomic status and student academic outcomes. 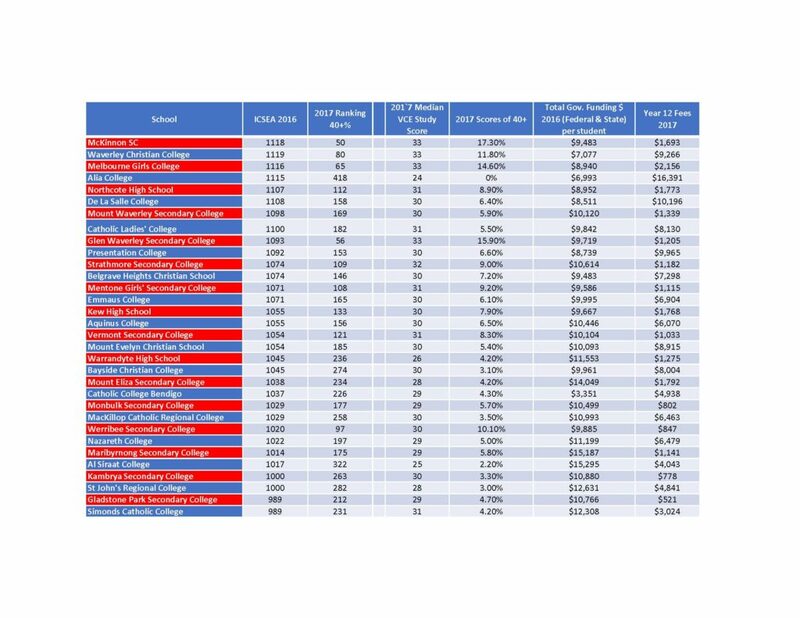 New analysis of the Year 12 results “school ladder” compares 455 private and public schools (schools with fewer than 20 students at year 12 were excluded) based on their VCE ranking and then compares both their VCE results and school based data including funding available from MySchool website. Even excluding select entry schools public schools outperform private schools with similar ICSEA rankings (Table 1). The median VCE score of these public schools is slightly above the private schools. Public schools had 18% of VCE scores over 40 or more (out of 50) compared to 17% in these private schools. Table 1 (below) ranks Victorian schools VCE results of similar or “like” private and public schools and median score, per cent of 40+ scores, total government (Federal and State) funding per student as shown on the MySchool website and Year 12 fees found on individual school websites. Table 1. 2017 VCE results by ICSEA a scale which allows for fair and reasonable comparisons among schools with similar students. ICSEA stands for the Index of Community Socio-Educational Advantage. While most media base rankings on the per cent of scores over 40, a more robust statistic is the median VCE score achieved by each school. That is the score achieved by the exact middle student in the year 12 class when their scores are ranked from lowest to highest. The median is a better indicator of overall student performance as it is not affected by relatively few high (or low) performances. When it comes to funding, private schools on average outspend public schools by a minimum of $9000 per student to achieve a similar result with almost 50% of their funding coming from federal and state funds for independent schools and almost 80% or more for Catholic schools. The School Resource Standard base amount is set at $13,764 for secondary students in 2018. This is what the majority of public schools receive from government funds. Table 2 lists the 22 most expensive private schools and their corresponding VCE ranking. On average in top performing private school parents paid over $25, 000 per student (Geelong Grammar with an ICSEA of 1149 ranked 124 in Victoria out of 455 schools and was the most expensive school in Victoria charging $36000 in 2017 just for school fees for year 12 (non-boarding) while parents in high performing public schools paid less than $1300. Wesley College ICSEA of 1159 charged almost $35000 and ranked 130 (Glen Waverely campus) and 78 (Melbourne Campus. A new review of research studies has found that money matters in education. It shows that there is strong evidence of a positive relationship between school funding and student achievement and that certain school resources that cost money have a positive influence on student results. As well, more equitable allocation of funds between schools increases equity in student outcomes. The best-performing education systems worldwide are those that combine equity with quality. They give all children opportunities for a quality education. 5 Responses to DAVID ZYNGIER. Spending more on private schools doesn’t guarantee success! Ok – it’s a bit confusing saying that all those fees do not an education make and saying that you don’t need money but new research says it can help …blah blah blah. Do the state school students get less total government funds than private school students? Who determines the spend on general school improvements? The Howard government gave out public school p and c $50k and the parents raised the same and built the areas first computer library. Then Rudds team gave us $200k to paint the school but the NSW Dept of Commerce skimmed 15%, the DET the same, the appointed regional head contractor and then the sub-contractors the same and we ended up with two blokes for a fortnight and they painted two classrooms. thank you david for your continuing insightful analyses of the inefficiencies let alone inequities in our government funding of non government schools. your work deserves wider public dissemination and discussion. i cannot understand why egalitarian australia almost alone of oecd countries not only funds non government schools at all but pours money into them while our public schools are run down with inadequate classroom facilities let alone having pools, theatres, stadiums, etc. little wonder that we have by far the highest level of participation of secondary students attending non government schools. the gonski school resource standard level of funding is well and only exceeded in nsw by non government schools, many of which get millions of public money; all government schools are funded below the standard and do not even have enough funding for demountable classrooms. whatever the overall budget constraint on commonwealth school funding no school above the gonski standard should receive any further government funding until all schools attain that minimum standard. Donnelly’s article doesn’t convince me. Socio-economic status is not simply about parental income or family wealth. It has cultural and educational implications. SES is a portmanteau variable. If you strip out parental educational attitudes, parental educational levels, existence or otherwise of role models, books in the home etc. etc you are gradually gutting the variable. But all these things are part of the socio-economic variable – that is why the word ‘socio’ is there! These things are not accidentally connected. They form an existential and geographical empirical complex of causally related factors. They are found together in neighbourhoods. I would be happy to reanalyse the data that purports to show SES accounting for only 15% of variance in academic outcomes. I haven’t read the longitudinal studies Donnelly mentions, but I very much doubt that it is possible, statistically speaking, to show that the variables listed to account for school success are independent of SES. Even teacher quality variables correlate with SES because, in Govt schools at least, individual schools are local schools, and schools in low SES areas have fewer experienced, well-qualified teachers in most subject areas. 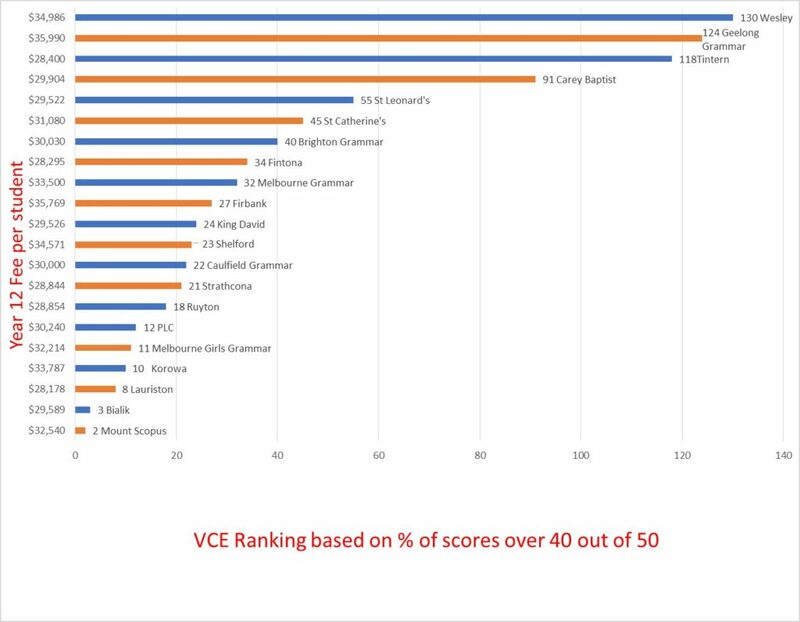 It is extremely disappointing to see you present Table 2 without acknowledgement that the VCE ranking of the five ‘lowest ranked’ schools (Wesley, Geelong, Tintern, Carey and St Leonard’s) is not necessarily representative of the schools’ effectiveness. The reason is that these five schools all offer the International Baccelaureate as an alternative to the VCE. Given that IB is often seen as a more challenging option, it is chosen by a self-selecting group of students who would probably do much better on average than the students in those schools who choose VCE. In other words, the ranking of these five schools might well be much better if they solely offered the VCE. This information potentially changes the interpretation of your analysis, and your readers have a right to be properly informed.